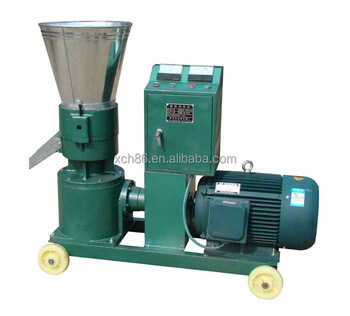 XCH-120 type feed particle machine simple structure, small footprint, low noise, 220-volt single-phase power to operate for lack of three-phase power for small farmers use conditions. XCH -120 models to learn the essence of domestic and foreign particles machines for new energy-saving products. After generally processed into powder feed fed, there is no feeding inconvenient poor palatability, livestock picky eaters, low utilization defects. With the new small particles advent and popularity of feed machinery, now can easily be processed into a powder feed pellets. Can be powered electric lighting, extrusion granulation, you can easily adjust the length of the particles under pressure roller extrusion from the die hole, simple structure, small footprint, low noise, 220-volt single-phase power to operations, the lack of three-phase power conditions applicable for small farmers to use. 1 . the production process itself under mechanical pressure, the feed starch can occur certain degree of ripening, resulting in a concentrated flavor, hard texture and feed for pigs, cattle, sheep, rodents eating biological characteristics, improve feed palatable, easy to eat. 2. particle formation process to make cereals, legumes factors degeneration, reducing adverse effects on digestion, can kill a variety of parasite eggs and other pathogenic microorganisms, reducing the variety of parasitic diseases and digestive system diseases. 3. feeding convenient, high efficiency, easy to control the feeding amount, save feed, clean and sanitary. In particular fish, the pellet was dissolved in water is very slow, will not be submerged sediment, waste can be reduced. 4. templates and press wheels made of high quality alloy steel wear-resistant materials refined, has a long life, reasonable structure, strong and durable.